You are here: Home / Great Deals / Craftsman Hooded Duck Bomber Jacket Just $39.99! Was $120! 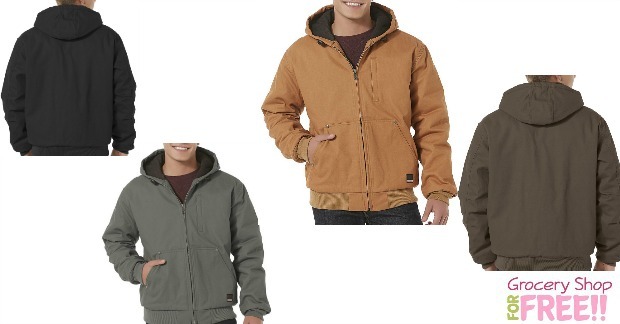 Craftsman Hooded Duck Bomber Jacket Just $39.99! Was $120! You can get this Craftsman Hooded Duck Bomber Jacket right now for just $39.99 – down from $120! There are 4 color choices. Craftsman delivers the rugged style, comfort and durability you want for on-the-job warmth with this men’s stain-resistant utility jacket. This heavy-duty coat is designed to provide you with superior warmth and easy care. A mid-weight top layer, this jacket supplies you with a solid-color canvas shell and an insulated quilted lining, and is packed with features for optimum clothing protection and functional style. This insulated workwear jacket has a long-wearing shell that’s infused with a special Teflon fabric protector that repels water, oil and grease. The quilt-lined hood has a toggle drawstring for extra protection against the elements. A heavy-duty zipper closure keeps wind and cold at bay, helping you battle the elements in confidence. This jacket is further fortified with triple needle construction and rivets at key stress points. The split pouch pocket is a great hand-warmer, and a zipper chest pocket and interior media pocket make ideal spots for stashing smaller items and a smartphone. You’ll also earn 400 Shop Your Way Points, too, which actually makes it $39.59! Final: $39.59 PLUS FREE in-store pickup or FREE shipping on orders over $49!